In December 2016, the California Supreme Court unanimously ruled that companies may be held liable if asbestos from a job site causes harm or sickness to a member of a worker’s home. “We conclude that it was foreseeable that people who work with or around asbestos may carry asbestos fibers home with them and expose members of their household. This factor weighs in favor of the existence of a duty,” wrote Justice Goodwin Liu, who wrote for the panel. That care pertains to preventing workers from carrying asbestos home via clothing and/or personal effects. The ruling came two years after 53-year-old Johnny Blaine Kesner, Jr. passed away from perotineal mesothelioma caused by secondhand exposure. After being diagnosed with the incurable, aggressive cancer in 2011, Kesner filed a lawsuit against Pneumo Abex, L.L.C., a New Jersey-based company known for producing asbestos brakes. He lost the initial case, but an appellate court ruled in his favor and sent it to the state Supreme Court. In a similar case, Haver v. BNSF Railway Co., the children of Lynne Haver filed a wrongful death suit against BNSF after her 2008 mesothelioma diagnosis and subsequent death in 2009 from its complications. Even though Kesner and Haver never worked directly with the material, their cases determined the Supreme Court’s ruling. Kesner v. Superior Court and Haver v. BNSF Railway Co.discredited a common misconception about asbestos-related diseases. 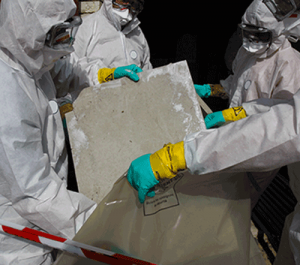 Employees who work in asbestos-contaminated environments are not the only ones at risk. In Kesner’s case, he lived with his uncle George, who worked for Pneumo Abex in the mid-1970s. For Haver, it was her former husband that worked with asbestos from 1972 to 1974 at BNSF – known then as Santa Fe Railway. The workers’ wore their work clothes home and interacted with family members, thus unknowingly exposing them to harmful toxins. Asbestos-related disease symptoms may take anywhere from 10 to 50 years to arise, which explains why neither Kesner or Haver became ill upwards of 35 years later. Nearly 125 million people worldwide are exposed to asbestos in the workplace. As a result, over 107,000 of them die each year from related lung cancer. In fact, nearly half of all occupational cancer deaths occur as a direct result to asbestos exposure. What those statistics don’t show is deaths resulting from secondary exposure. It’s nearly impossible to know just how many of the 200,000 people who live with asbestosis in the United States, or the 2,000 to 3,200 Americans that die from asbestos-related lung cancer annually contracted it second hand. Thus, the onus falls upon the company to ensure that it takes every measure to not only keep workers safe, but their families as well. The first step to keeping workers and their families safe is to be in compliance with OSHA Standard CFR 29 1910.1001. Employers are required to institute a medical surveillance program for all employees exposed to airborne concentrations of the substance at or above the permissible exposure limit (PEL) or excursion limit (EL). The full OSHA asbestos physical must be performed by or under the supervision of a licensed physician. Furthermore, the physical must be made available annually with the exception of the chest x-ray, which is conducted every five years within the first ten years of exposure. After ten years, the frequency of the x-ray depends on the age of the employee. Employers must also keep accurate records of exposure measurements for at least 30 years. If the workers are at risk for asbestos-related disease, then their families and friends likely are as well.